Suzuka Circuit is somewhat remote and hard to get to. It is located between the cities of Tsu and Yokaichi in Mie prefecture. The trains that visit the area generally stop at least 1km away from the circuit and the walk can be brutal if done in the summer. For my first trip to Suzuka for the F1 race, I took a special reserved express train to the circuit and then walked 5 km, maybe less, to Shiroko Station and took a regular express train back. It is not an ideal situation to be honest but for this trip, I learned a lot in what I should and shouldn’t do. 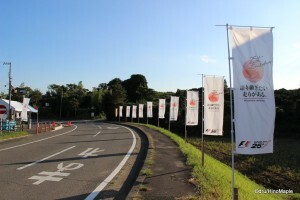 There is a lot of information on the train schedules and it will somewhat depend on the day but getting to the circuit is still much easier than going to Fuji Speedway or even Motegi if you are only taking public transportation. The closest station to Suzuka Circuit is Suzuka Circuit Inou Station. It is about 1 km from Suzuka Circuit and not too far from Turn 1. 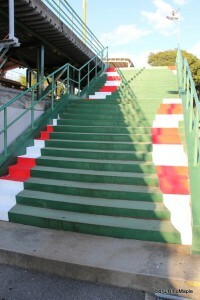 It is by far the easiest station to go to after each day you visit but you really have to be careful about the timing. On Thursday, they don’t add extra trains, so the train would come every hour. If you just missed it, you’ll be stuck at a station with almost nothing to do. There is a bar right at the station, but I didn’t try it out so I wasn’t sure how good or bad it was. On the other days, there is a line, so the bar is well located, but not useful as you’d end up waiting for hours and still have to line up. Getting the train schedule for this station is essential. You should get both the special schedule and the regular schedule. From Friday to Sunday, they run extra trains that go from Nagoya all the way to Tsu, and beyond. It is the most convenient way to get to and from the circuit. When travelling towards Tsu, you are definitely lucky as you’ll probably get a seat and there won’t be too many people going that way. About 80% of the fans head towards Nagoya, and I’d say 60% will go all the way to Nagoya. On Thursday, the station operates normally, which means you have to grab a ticket when you board the train, at the back, and when you disembark at the front, you pay the train driver. From Friday to Sunday, they have special tents set up for you to pay ahead of time. You can stop at any of the attendants at the tent and get your ticket printed out for you. It is pretty easy and all you have to do is say what your destination is. When heading to the circuit itself, be sure that you don’t use your IC card either as Suzuka Circuit Inou Station isn’t set up for processing your cards. You have to buy special tickets at the station you board. There are also local trains available but it is better to take the express trains whenever possible and the Mie express train service is your best bet. If you have the energy, there is an alternative to going to Suzuka Circuit Inou Station. About 5 km from Suzuka Circuit is Shiroko Station. It is a long walk to get to Shiroko Station but the freedom you have from having less people to queue behind as well as having a bit more space within the train itself is sometimes worth the effort. Going from Nagoya to Shiroko is faster than going directly to Suzuka Circuit Inou Station, but from Shiroko to Suzuka Circuit, you have a wonderful 5 km walk in the countryside; please not the sarcasm. I would highly recommend taking a shuttle bus or a taxi but walking is doable and I did it the first time I went to Suzuka. 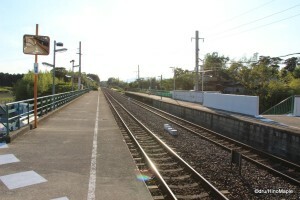 Shiroko is a major station on the Kintestu train lines and all trains will stop there. You can splurge by paying for the special express trains with reserved seating, but you can easily take a regular express train which adds just one or two extra stops and the difference in timing is only about 5 minutes or so. If you want to splurge and just relax on the trip, I would recommend the special express trains, but after the event, the express trains are often overbooked and there are long lines to get onto the trains and the regular express trains are just as good, albeit crowded. Unless you are a race driver, your options of getting to Suzuka will probably hinge on public transportation. I’m sure there are special tours that go there, and there are special bus tours that depart Tokyo on Friday night, arrive at the circuit when the gates open, and bring you back by Monday morning. I personally wouldn’t want to do that but the options are there. 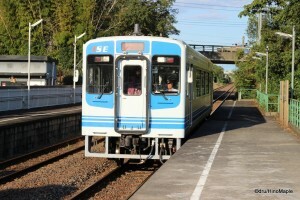 I have always enjoyed taking trains and prefer using the train to get to and from Suzuka. I’d probably do the exact same thing next time. If you are a casual fan, you may want to add a little more comfort by paying for reserved seats, but it really won’t matter as you’d probably end up waiting several hours for a train. You are better off taking the first express train you can and just suffering the rush to get back to Nagoya, unless you were smart enough to head towards Tsu. This entry was posted in Chubu, Kansai, Travel and tagged Mie, Mie Prefecture, Shiroko, Shiroko Station, Suzuka Circuit, Suzuka Circuit Inou, Suzuka Circuit Inou Station, Yokaichi by Dru. Bookmark the permalink.